In recent months, there have been a lot of stories in the news about the Labour party and something called anti-Semitism. On Monday, seven Labour Members of Parliament (MPs) quit the Labour Party in protest at the way their leader Jeremy Corbyn is dealing with anti-Semitism in the party and handling Brexit. Mike Gapes - one of the MPs who resigned - believes Mr Corbyn should be doing more to tackle the problems in the party, stating: "I am sickened that Labour is now perceived by many as a racist, anti-Semitic party." Mr Corbyn said he was "disappointed" by the MPs' decision to leave the party. But what is anti-Semitism and why has it become a problem for the Labour party? It can be a form of hate crime, depending on how serious the incident is. What has happened with the Labour party? The Labour Party has been in the news a lot recently for the views reportedly expressed by some of its members, complaints that those views are anti-Semitic and then more complaints about way the party has handled it. In 2016, the Labour Party leader, Jeremy Corbyn, announced an independent inquiry into anti-Semitism and other forms of racism in the Labour party. 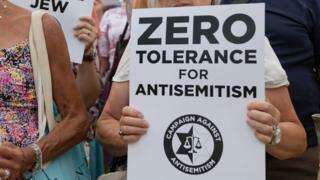 The inquiry reported that while the Labour Party was not "overrun" by anti-Semitism, there was an "occasionally toxic atmosphere" and made recommendations about how to deal with this, not all of which have been implemented yet. Jeremy Corbyn - who has been a supporter of rights for Palestinian people in conflicts between Israel and the Palestinians for a long time - has been accused of anti-Semitic behaviour himself, of not cracking down hard or quickly enough on anti-Semitism, and for attending or taking part in events with other individuals who are accused of anti-Semitism. He has always insisted he isn't prejudiced. "I have on occasion appeared on platforms with people whose views I completely reject," he said in response. "I apologise for the concerns and anxiety that this has caused." Mr Corbyn has acknowledged that the Labour party has a problem with anti-Semitism and there are many cases waiting to be resolved. 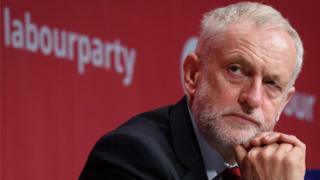 "We recognise that anti-Semitism has occurred in pockets within the Labour Party, causing pain and hurt to our Jewish community in the Labour Party and the rest of the country," he said, adding that he was "sincerely sorry". "Anti-Semitism is a poison in our society, I am determined to drive it out of our society, including wherever it raises its head in my own party and that's exactly what we are doing." But there have been arguments within the Labour Party about how to deal with the issue. To try to draw up clear party rules, lots of people said Labour should adopt a definition of anti-Semitism written by the International Holocaust Remembrance Alliance (IHRA) - a well-respected worldwide group that fights for education and remembrance of what happened to Jews and other groups in the Holocaust, in the years leading up to and during World War II. Some members felt it was important to accept the full wording to show clearly that Labour rejected anti-Semitism, but others didn't want to accept the full wording as they felt it wouldn't allow them to criticise Israel. However, at the start of September 2018, the party accepted the full definition with an accompanying statement that "this will not in any way undermine freedom of expression on Israel or the rights of Palestinians". There was a mixed response to this. Labour's Deputy Leader Tom Watson has said he hoped that adopting the full IHRA definition would be the "start of a new conversation with the Jewish community in Britain". Talking about the extra statement, BBC political editor Laura Kuenssberg explained: "It will be important to many of Mr Corbyn's supporters who want the right to criticise Israel." 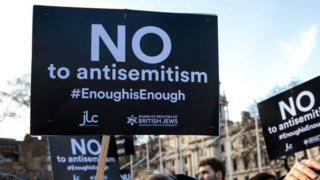 But campaign group Labour Against anti-Semitism said it was "disappointed" by the added statement, which it feels will give some people an excuse to express anti-Semitic behaviour. 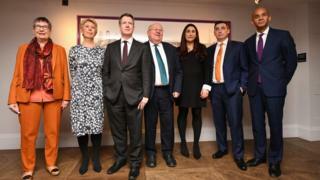 After the resignation of Anne Coffey, Angela Smith, Chris Leslie, Mike Gapes, Luciana Berger, Gavin Shuker and Chuka Umunna from the Labour party, the issue of the party tackling anti-Semitism is back at the top of the news. Ms Berger said Labour had become anti-Semitic and that she was "embarrassed and ashamed" to stay. Mr Corbyn responded: "I am disappointed that these MPs have felt unable to continue to work together for the Labour policies that inspired millions at the last election and saw us increase our vote by the largest share since 1945." He went on to say that "now more than ever is the time to bring people together to build a better future for all of us". Is anti-Semitism on the rise in the UK?